And Councilman Philip Kingston wants city staff to keep a log of developers whose projects don't work out at the city's expense. 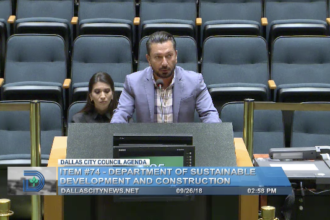 The Dallas City Council didn’t bite on developer Yigal Lelah’s request on Wednesday to rezone a plot of land about two miles north of Pleasant Grove, largely because of his involvement in the failed Patriots Crossing development from a few years back. Yigal Lelah speaking before the City Council on September 26, 2018. About eight years ago, the city gave Lelah $4.5 million to acquire land across from the VA hospital, on which he was supposed to build a mixed use development. That never came to pass, for myriad reasons I wrote about in a blog post earlier today, and his LLC wound up filing for bankruptcy. The city had to snag the land in foreclosure. It was a mess that rambled on for about six years. Lelah defended himself after Griggs’ comments. He said the city of Dallas didn’t lose out on $4.5 million because it now has the land. He said he spent six years acquiring that land, “tearing down drug houses, relocating residents into new houses; I did everything the city asked me to do in regards to that project.” He called the denial a “personal vendetta.” And, indeed, the city is the one who issued the money for the land. But Lelah was the developer who didn’t deliver the development he promised. Councilman Philip Kingston, of East Dallas and downtown, called for the city to make a list of “bad actors” who would be flagged when they request something from the City Council, however small. He also called for the city to look closer at a developer’s history to see whether they have delivered on their proposals in the past. The City Council voted unanimously against the request.